This post was originally published at staceytay.com. This semester, I got a chance to write a ray tracer for my parallel programming class. I took this class because I thought it’d be fun to learn about parallel programming constructs and practices, but I didn’t think that I’d end up writing a ray tracer for a class assignment. Although I’ve never done any computer graphics programming before, I thought this assignment was neat since it gave me an idea of how computers can generate images and I ended up with a very visual result of my work. 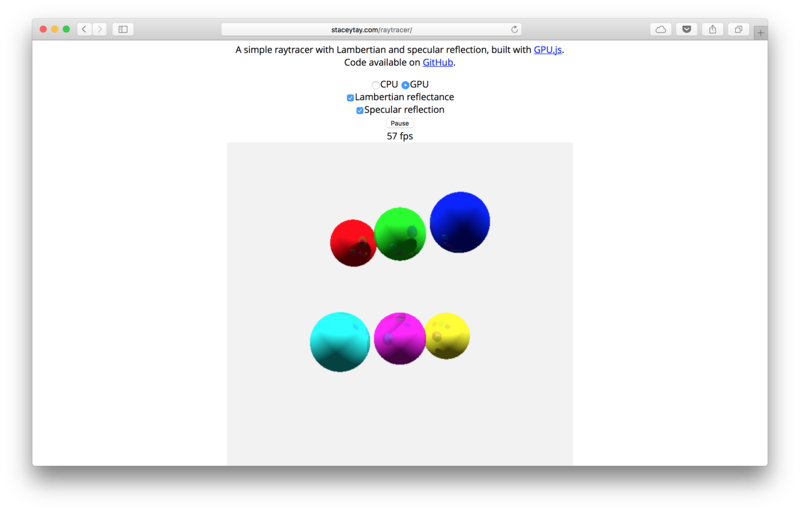 So, I wrote this post to consolidate what I learnt on ray tracing and doing it in the browser using the GPU, with help from GPU.js. Ray tracing is a method for generating realistic looking images based on tracing the path of light rays through a “world”, i.e. the scene in which we would like to generate these images. It mimics the way in which light enters a camera or an eye to form images and simulates that process to construct images. Imagine you’re shooting a movie. You’d have a camera, lights, and things in your set. When recording your movie, your camera records whatever light rays that enter its viewpoint. 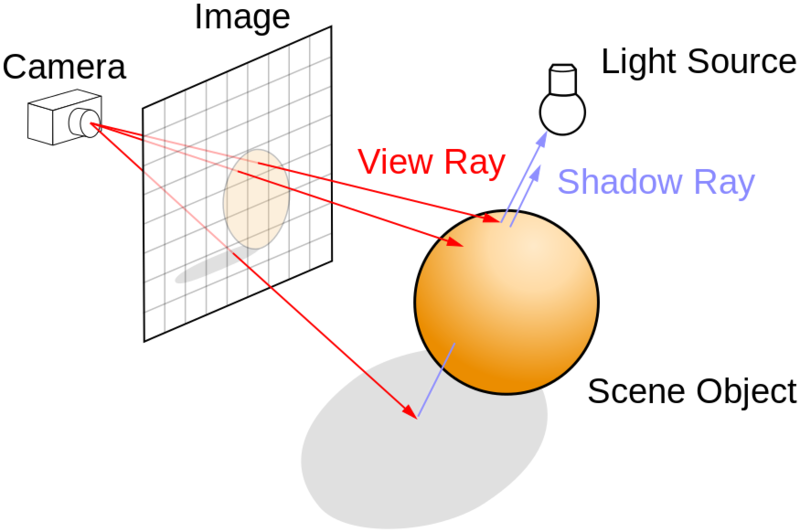 In ray tracing, you have the opposite effect for the light rays. Instead of calculating the rays based on light sources in the scene, we generate the rays out of the camera so that we only compute the colours of the rays that we know will be inside the picture. This way, we don’t waste resources computing rays that will never be part of the image. Ray tracing, especially when compared to other techniques for generating images, allows for realistic rendering of images since we can naturally mimic properties of light—such as absorption, reflection, and refraction—when it hits a surface. As a result, ray tracing is computationally costly and hence typically suited to situations where we can pre-render the images ahead of time. But, since each ray trace, and correspondingly its pixel colour on the screen can be determined independently, determining the colours for each pixel and hence generating the image can be done in parallel and hence makes this problem particularly suited for the GPU. This is where GPU.js comes in. GPU.js has been rather apt for this task. You create a kernel in graphical mode and pass in a function that computes the colour for each pixel on a canvas that the kernel returns. This can be as simple as calling this.color (r, g, b) to set the pixel colours, using RGB values, that corresponds to the x and y coordinates that each thread is assigned to. A simple GPU.js kernel that creates a 800 x 600 blue canvas using the GPU and inserts it into a web page’s body. It took a number of nights working on this and getting used to GPU.js’ quirks, but I’m very pleased with the end product. It was especially gratifying to be able to see the visible differences when implementing specific light tracing properties such as Lambertian reflectance and specular reflection—giving a surface a “matte” appearance and a mirror-like reflection respectively. I also like that the ray tracer runs in a browser, which allowed me to make an interactive ray tracer online. I thought Jingwen did a really great job in making his ray tracer more interactive (you can move the camera and dynamically add more spheres in it). Additionally, when toggling between CPU and GPU mode, the differences in rendering speed is notable, so GPU.js was definitely helpful in making tracing fast. I don’t think it would have been as cool if the ray tracer wasn’t fast enough to see the animations run smoothly. This has been an unexpected and unexpectedly fun assignment. A screenshot of my ray tracer, at //staceytay.com/raytracer/.